TIANJIN, CHINA / ACCESSWIRE / May 16, 2016 / China Auto Logistics Inc. (the "Company" or "CALI") (NASDAQ:CALI), a top seller in China of luxury imported automobiles and a leading provider of auto-related services, today reported a year over year gain in 2016 first quarter revenue of 57.29%. With this improvement, the Company saw a 60.21% narrowing in the loss reported for this year's first quarter compared with the same period in 2015. The Company attributed the sharp sales increase in the 2016 first quarter to a continuation of the growth trend in the second half of 2015, spurred by the devaluation of China's currency -- the Renminbi against the U.S. dollar -- which the Company believes led customers to anticipate increasing costs for imported autos in the periods ahead. Additionally, Mr. Tong Shiping, Chairman and CEO of the Company, stated, "Our imported automobile sales have benefited from the growth in domestic household income despite the substantial decline in the Chinese stock market, and a slowdown in China's economy." He added, "Unfortunately, our margins in this business continue to be low due to intense competition and our desire to maintain our leadership position by offering the best prices while also providing higher margin auto-related services, such as our dealer financing services." Mr. Tong noted further that, as reflected in positive first quarter EBIDTA of $611,425, "We continue to be weighed down by the improving but still high interest and depreciation expenses relating to our acquisition of the Airport International Auto Mall. We greatly appreciate the six month extension we have received until November 30th of this year for our next installment payment on the acquisition, paying 6% interest per annum on the balance. We will be working hard in this time frame to continue to generate improved results. Our optimism also is based on the new "Parallel Imported Vehicles" scheme being initiated by the government in a few key cities in China, which we expect will permit us to be even more competitive going forward." In the three months ended March 31, 2016, net revenues grew 57.29% to $137,391,006, compared with $87,350,162 in the same period of last year. Sales of automobiles accounted for 98.87% of total revenue in the first quarter of 2016. Gross profit in the 2016 first quarter increased to $1,278,100, compared with $481,842 in the same period last year, an increase of 165.25%. Profit margins also improved year over year to 0.93% in the first quarter of 2016, from 0.55% in the first quarter of 2015. First quarter of 2016's EBIDTA (earnings before interest, depreciation, tax and amortization) was $611,425, reflecting add-back of primarily depreciation and amortization expense of $530,599 and interest expense of $1,591,503. 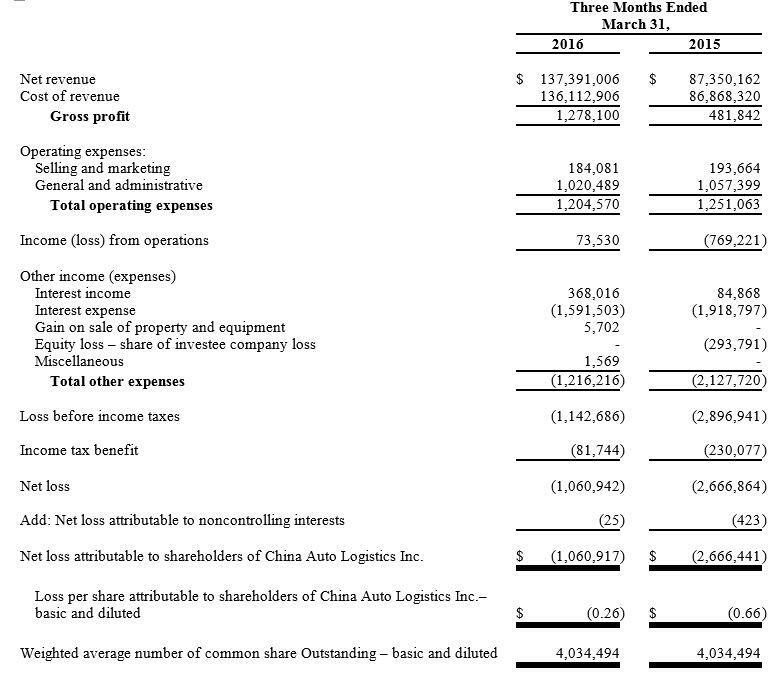 As of March 31, 2016, the Company had a working capital deficit of $31,845,848, including $62,656,059 in current liabilities for short term borrowings, and $36,683,638 in current liabilities payable to Hezhong in connection with the Zhonghe acquisition. 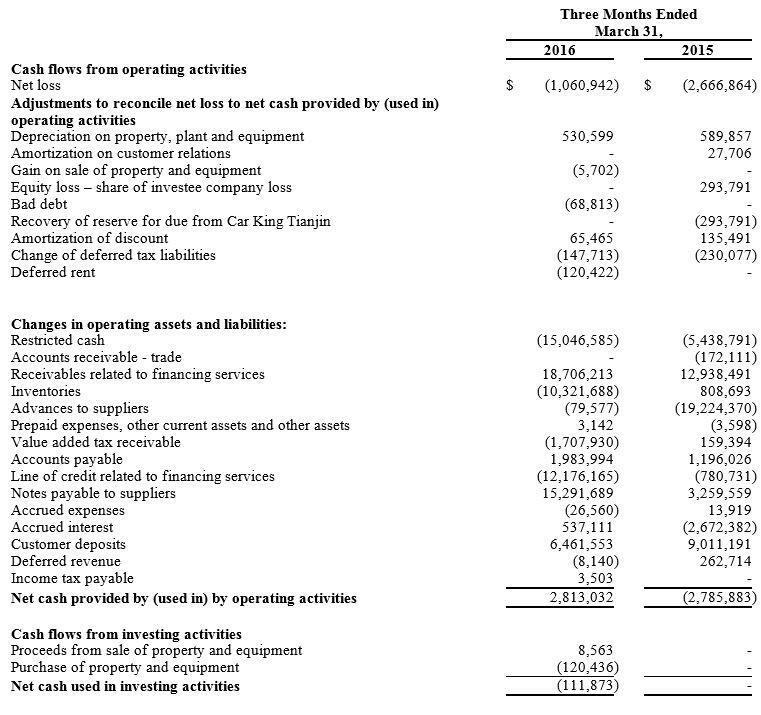 The Company’s net loss, working capital deficit, and other factors led the Company to continue to include a “going concern” paragraph in the Notes to its consolidated financial statements. Sales of Automobiles - As noted above, auto sales in the first quarter of 2016 grew 57.56% compared with the first quarter of 2015. During the first quarter of 2016, the Company sold 1,304 automobiles, compared with 796 in the first quarter of the prior year, an increase in volume of approximately 64%. The average selling price per vehicle in the 2016 first quarter was $104,000, down slightly from $108,000 in the same period a year ago. The top three selling brands in the 2016 first quarter were Land Rover, Mercedes Benz, and Toyota. 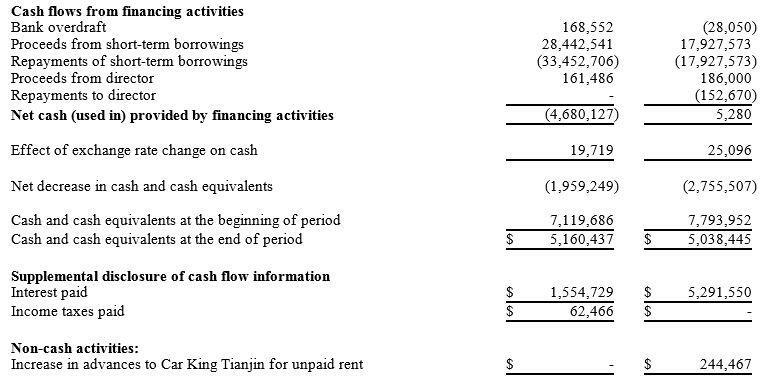 Financing Services - A slight improvement in the Company's liquidity in the first quarter of 2016 allowed the Company to have more working capital utilized in its temporary credit extension services, a key service which it had limited since the Zhonghe acquisition. This helped boost revenue from the fee income portion of Financing Services by 31.51% to $543,735. 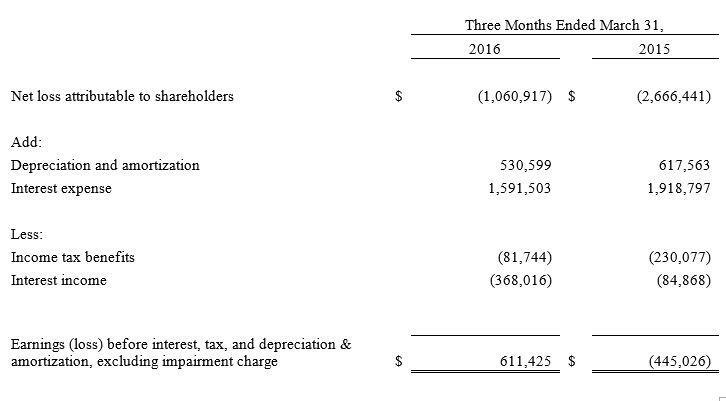 Total revenues from this business were $1,220,602 in 2016, up 9.59% year over year. Gross margin in Financing Services in the first quarter of 2016 was 44.55%, absent a maintenance fee on a credit line from one of the Company's bankers which helped reduce the Financing Services gross margin in the same period a year earlier to approximately 22%. As of March 31, 2016, the Company had approximately $96 million in lines of credit available to use in the Financing Services business. Airport Auto mall Automotive Services – In this business segment are two businesses: sales of used automobiles through Car King Tianjin, a 40% owned joint venture with Car King; and, leasing out space in the Airport International Auto Mall. 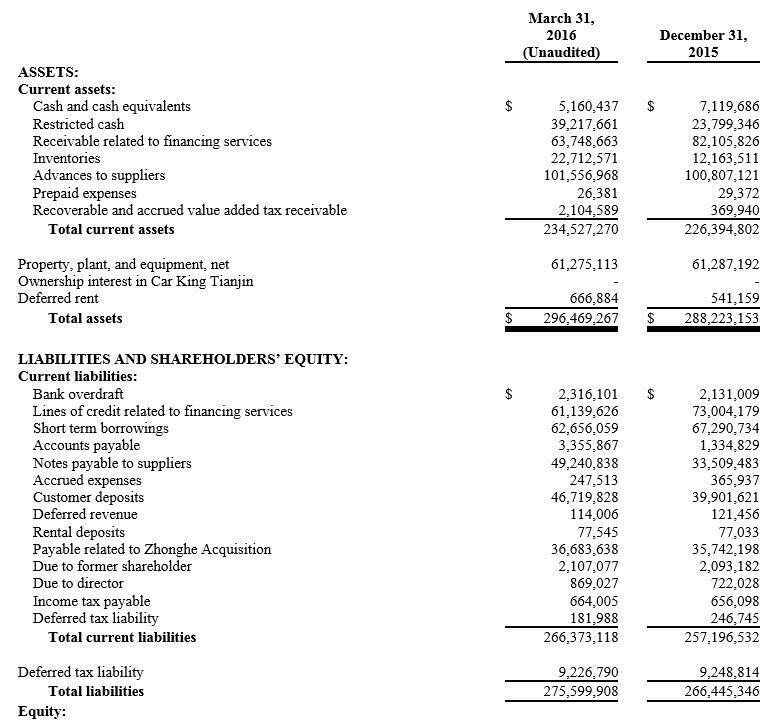 Since the ownership of Car King Tianjin is less than 50%, Car King’s financial statements are not consolidated into the Company’s consolidated financial statements. The Company believes that used car sales in China will grow substantially in the future. Leasing income in the first quarter of 2016 was $326,987. "I am pleased that 2016 got off to a strong start," Mr. Tong said, "and believe we will see consumer demand for luxury imported autos continue to grow as China's economy improves. Our goal continues to be maintaining leadership in this segment, and when possible, to add businesses that can expand our profit margins." The Company will discuss 2016 first quarter results during a live conference call and webcast on Tuesday, May 17, 2016 at 8:00am ET. To participate in the call, interested participants should call 1-888-510-1765 when calling within the United States or 1-719-457-2085 when calling internationally. Please ask for the China Auto Logistics 2016 First Quarter Investor Conference Call. Conference ID: 4987210. There will be a playback available until 05/24/16. To listen to the playback, please call 1-877-870-5176 when calling within the United States or 1-858-384-5517 when calling internationally. Use the Replay Pin Number: 4987210. This call is being webcast by ViaVid Broadcasting and can be accessed by clicking on this link http://public.viavid.com/index.php?id=119670 at ViaVid's website at http://viavid.com. China Auto Logistics Inc. is one of China's top sellers of imported luxury vehicles. It also provides a growing variety of "one stop" automobile related services such as short term dealer financing. Additionally, in November, 2013, it acquired the owner and operator of the 26,000 square meter Airport International Auto Mall in Tianjin, which, among other things, is now the flagship site for its joint venture with Car King (China) Used Car Trading Co., Ltd.